One win down, six to go – that’s the reality of Toronto FC’s season, every game is must win, their playoff hopes resting on the thinnest of margins – so, no pressure then. Today’s match against the energy drinks is one of the toughest tests they’ll face down the stretch; the two teams have a stormy history, New Jersey has dashed Toronto’s hopes more than once, and then there’s the tension fraught series from last year’s playoffs – the Red Bulls don’t have a tunnel, do they? Don’t get hurt – TFC have managed to not have any new players injured in the last week (calf cramps notwithstanding of course), and have even seen the welcome return of Auro. To come close to being successful they have to stay healthy. Bradley Wright-Phillips – the most dangerous player from the energy drinks, fresh off a hat trick against DCU, 19 goals so far on the season and he pretty much always scores against Toronto. So umm, watch him. Daniel Royer – the other player to watch. Smart, creative, and 10 goals to his name so far this year – he and BWP have been a lethal combo. Auro – while the opinions of the Campeones Cup differ, what can’t be argued is how his insertion into the match on Wednesday made Toronto look better. They’ve really missed his abilities both offensively and defensively on the right – could we see him start today? Here’s hoping. Drew Moor – will he play? Possibly the most important missing piece is Moor, yes his defending is needed, but really it’s his ability to keep the back organized (from the keeper on out) that TFC sorely need. Fight! Everyone remembers the ‘Rumble In The Tunnel’ from last year – will emotions run high again? Both teams have something on the line in this one; TFC are fighting for their season and the energy drinks are fighting not just for the Supporters Shield, but to prove they’re more than just a playoff team. Seba – he had a very good game against the LA Zlatans, he needs to have an even better one today. He won’t have a porous defense to terrorise – quite the opposite as the energy drinks are the stingiest team in the league – so he needs to be Seba at his best. Defend. Defend. Defend. This above all else – TFC have struggled (to be kind) at the back this year – what wins games? Defense. 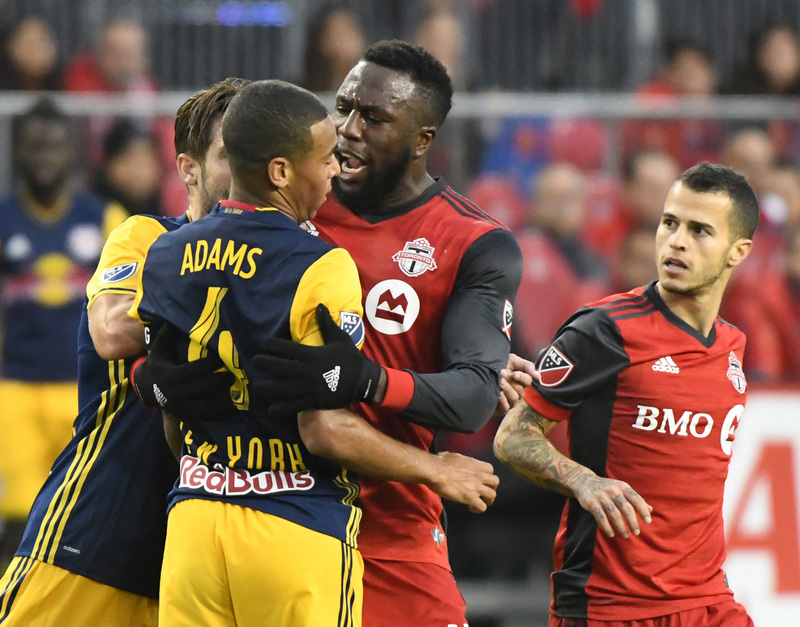 This match is one that in the past couple of years Toronto FC fans would relish – a top team, the likelihood of a wild, well fought contest, b underlying storylines – it has it all! Instead, I think many of us are wishing we could play a minnow, any minnow to keep some momentum. However if you want to be the best, you’ve got to beat the best – may sound hokey, but it’s true. I hope they win, but this game more than almost any other they have remaining makes me very nervous. Sticking with my podcast prediction of a 2-1 loss for TFC.